The world's most expensive pop–up shop – but for how long? Central Saint Martins came into the spotlight last week when it was speculated that flats in its former buildings on Charing Cross Road are being sold for a starter price of £4.5million. 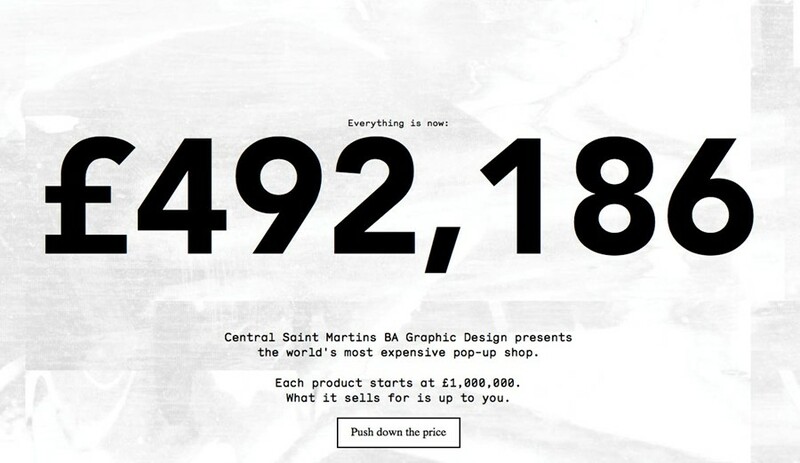 Now second-year Saint Martins graphic-design students are opening the most expensive pop-up shop in the world – but with a mission to drive prices down, not up. Worth is a week long pop–up shop being opened by students at the art school that "questions what value really is and brings meaning to the marketplace by turning the world of commerce on its head". It is selling 94 limited-edition artworks at a starting price of £1 million, but that figure falls as people share the site on social media. Already, prices have fallen by over £500,000 after the stunt spread like wildfire on Twitter last night. So the products are rapidly declining in price, but are they declining in value? We spoke to Tatiana Aspinwall, one of Worth's project leaders, about what galvanised them to start Worth. Dazed Digital: Where did the idea for Worth come from? Tatiana Aspinwall: We just wanted to raise some money for the degree show and make sure that we could do it again the following year. Initially it was an experiment in viral sharing and self-propagation – often people share things online with no real reason but here there's a motivation. It's a publicity stunt, sure, but there's a point to it. There is a limit on how low the price can go – I'm not going to tell you what it is, but if we manage to get enough sponsors then we'll give everything away for free. We just want people to be able to afford it and for it be available to everyone. Worth means that everyone will be able to buy it and people can work together to dictate the price. DD: What is the artwork like? Tatiana Aspinwall: There's a huge variety of art – from recipe books, to a printer that takes photos and 3D prints people's faces. A couple of students have managed to involve the graffiti artist Jimmy C – he's doing a large image across a wall, it'll be broken down and each individual brick sold. DD: Is Worth saying that art is too expensive? Tatiana Aspinwall: Yeah, it's playing with the idea of 'what is the value or something?' or 'what is the worth of something?' The original theme for the brief was 'responsibility', and the idea of worth fits in with that perfectly. DD: What would you like to see happen with Worth? Tatiana Aspinwall: Our main priority is involving everybody, particularly the public, and make this something that reaches outside of the university. We're targeting passersby and attempting to ensure that art isn't exclusive to all the people who would normally go to art exhibitions.